In case you hadn't realized, today is April 20, the official high holiday of, well, getting high. It's a day either tepidly acknowledged and/or seriously celebrated by plenty of former, current, and aspiring stoners, many of whom will go around wishing everyone a "happy 4/20" followed up with an obligatory "blaze 'em if you got 'em, bro" until they're red in the... eyes. Of course, it's also the sort of irreverent unofficial holiday that national brands and chains love, because it's an opportunity for them to give a little wink and nod to the youngin's on social media that they're cool with the ganj. However, it's also an opportunity for them to very easily embarrass themselves with some try-hard attempt to seem hip on Twitter. Why can't they all just take a cue from the smart folks at Burger King, and just use the day as an excuse to unleash something people actually enjoy? In any case, we've rounded up some of the best and worst examples so far, and we'll keep it updated throughout the day. Rejected Friends Storyline: "The One Where They Got High AF"
Plenty of brands shoehorned some sort of explicit acknowledgement of what day it is. 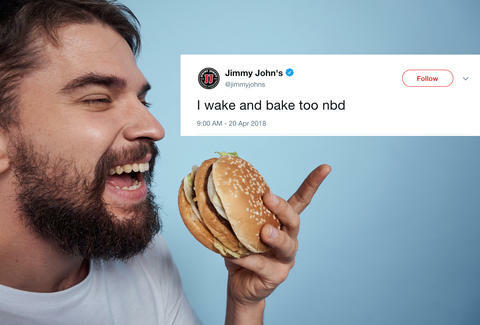 Fast food chains are really leaning into things, which only makes sense considering people with the munchies are among their best customers. Others took a more cerebral approach in hopes of eliciting some sort of "whoa dude" reaction.